"3LA1, V-2100" by Timothy K. Perttula and Robert Z. Selden Jr. CONTEXT INFORMATION: From a grave (Burial C) in a cemetery excavated in 1940 by Glenn Martin. Associated vessels in the grave are V-2098, V-2099, and V-2101. DECORATION: The rim is plain, except for a horizontal row of tool punctates at the rim-body juncture. The body has vertical brushed-incised lines that end well above the vessel base. Karnack Brushed-Incised, var. 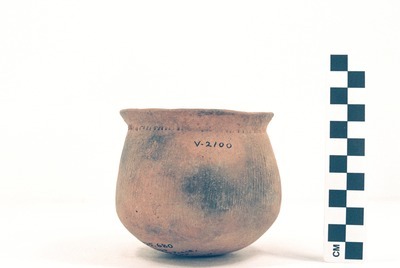 Karnack jar (5425-680).